Collection Section: Twin Lens Reflexes. Not the best of photos, sorry; but I couldn’t leave this camera out, even though it’s no longer in my collection. 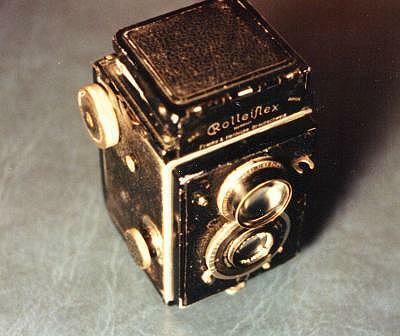 The Rolleiflex of 1929 was not the first TLR, but it was the camera that married the TLR layout with the 6×6 cm roll film format to create one of the great camera types of the 20th century. Another poor photo of a great camera: the Rolleiflex Standard of 1935 added the rapid film wind crank and the mechanical frame counter and pointed the way to the “modern” Rolleiflex. 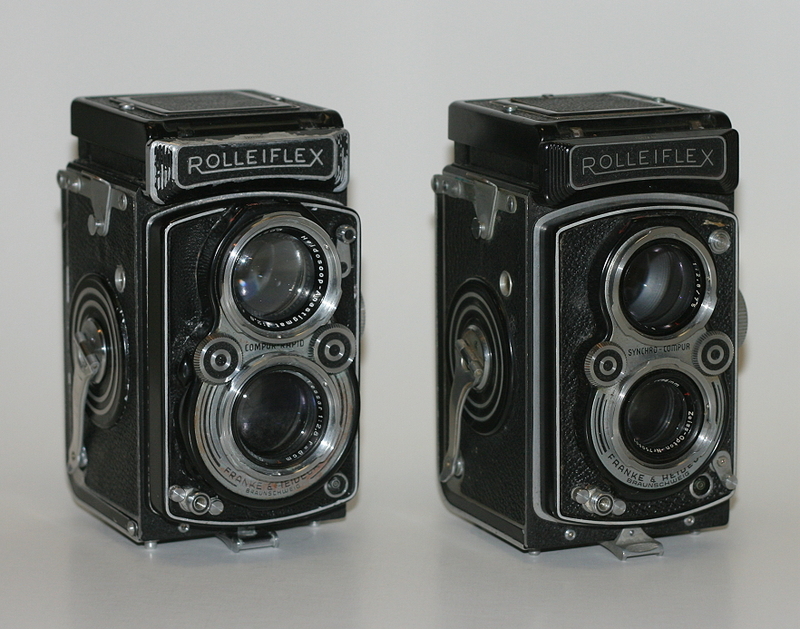 …and here IS the “modern” Rolleiflex (at least by my standards) – two of them in fact. On the left is one of the very first f/2.8 Rolleis, the 196th camera made, from 1950. One of the things I like about it is the fact that it’s a West German camera made with an East German Carl Zeiss Jena Tessar lens in the post-Berlin-Airlift Cold War years. On the right is its more mainstream stablemate, a 1951 MX Automat with the West German f/3.5 Zeiss-Opton Tessar. Back at that time, it was the East German branch of the company that owned the rights to the Carl Zeiss name, and the West Germans who had to choose another. The power of the Western courts and financial power would change that over the coming years. The MX Rollei is one of the great bargains in medium format: solid construction and excellent lenses combine with prices competitive with the better Japanese copies in this model. Zeiss Ikon could not let the challenge from an upstart like Rolleiflex go unanswered, but their answer was tentative and uncertain. 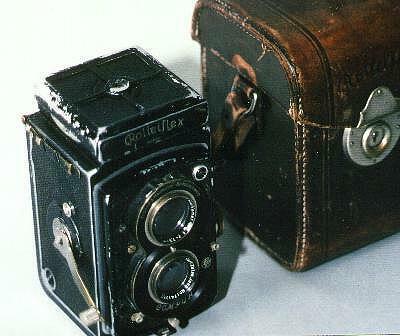 The Zeiss Ikoflex began as a distinctly unprofessional camera, virtually a twin lensed box camera. 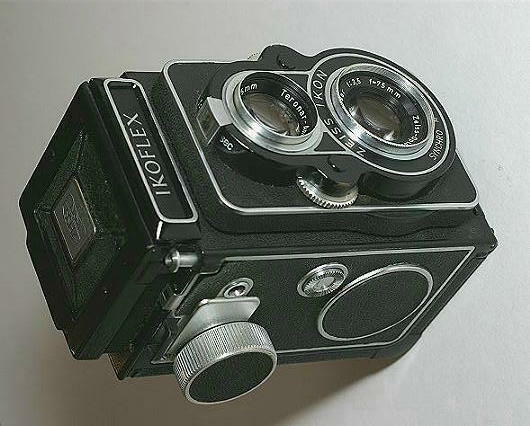 They followed quickly with a succession of more sophisticated models to compete with the Rollei, although they never managed to match its combination of advanced features and reliability: the more sophisticated the Ikoflexes became, the more reliability problems they seemed to have. The Ikoflex returned after WWII with a new design, but with knob wind, Novar and Tessar lenses, fussy handling and sub-Rollei levels of reliability, the Ikoflexes were, at best, competitors for the Rolleicord rather than the Rolleiflex. This is the second-to-last model, a mid-1950s IIa with Opton-Tessar lens in Synchro-Compur shutter – about as good as the Ikoflex ever got. The TLR format was taken up by manufacturers all over the world. 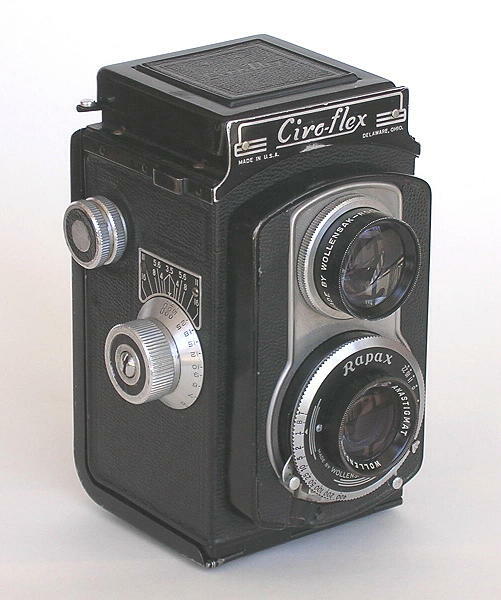 One of my favorites is the Meopta Flexaret of Prague, Czechoslovakia. This was the model from which the Minolta Autocord evolved. 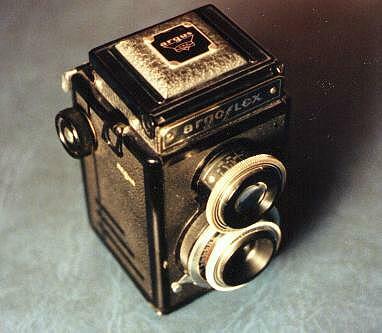 The first medium format TLR made in the United States was the Argoflex E, introduced about four years after Argus had popularized 35mm over here with the Model A. Not long after the Argoflex, the Ciro-Flex came out with a faster f/3.5 lens and Rollei-style focusing panel. The best were the C (shown here), the E and the F. These 3 models all had the better Rapax shutter, with speeds from 1 to 1/400 second. The C even had parallax correction in the viewfinder, which was dropped in favor of a brighter Fresnel finder in the E. The F was the top of the line, with a 4-element, f/3.2 lens. 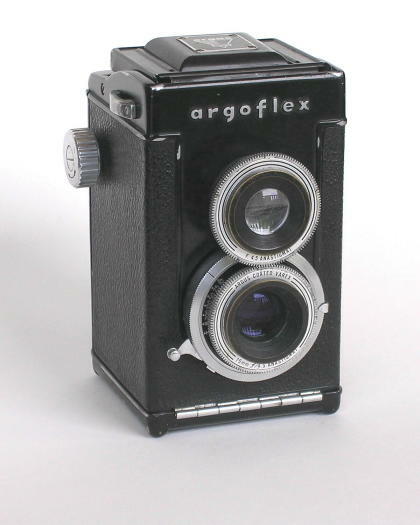 The original Argoflex, like the Model A, had a body made of Bakelite phenolic plastic. 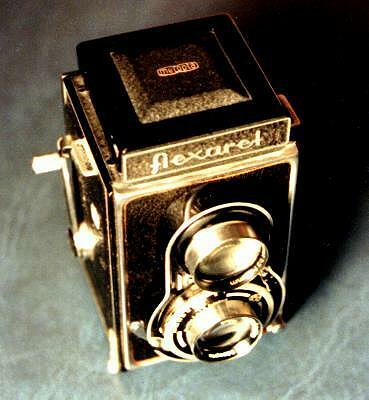 Toward the end of the 1940s, though, Argus upgraded the camera with an all-metal body. Unfortunately, they didn’t upgrade anything else; the lens, shutter, focusing system and red-window frame counter were all the same as the original, and to make matters worse, the later cameras no longer accepted 120 film. This is the last model, the Argoflex EF, synchronized for flash. 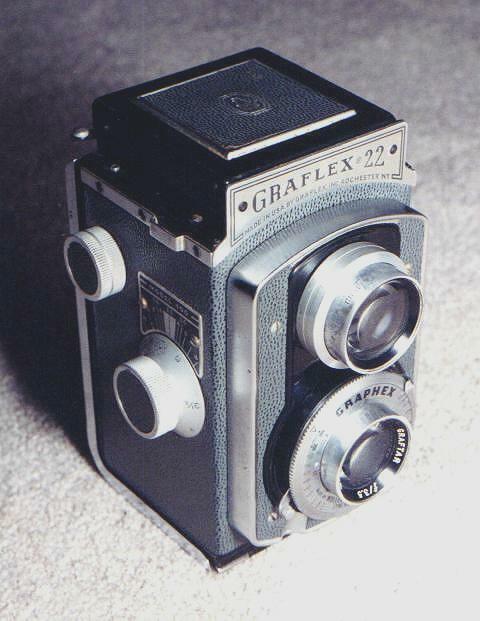 In the early 1950s, Graflex bought Ciro and the Ciro-Flex became the Graflex 22. The camera is the same, but the Graflex name and grey leatherette lend a little more style….. Yet another variant of the Ciro-Flex, the DeJur as in many ways a nicer and more ambitious job than the Graflex 22. 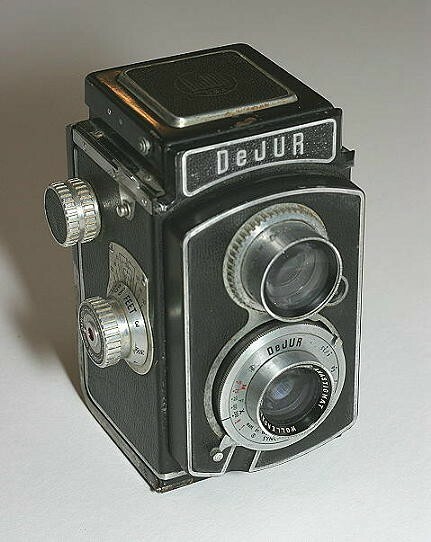 The DeJur nameplate is a die casting attached on top of the Ciro nameplate, and they also substituted a die cast front focusing panel for the stamped piece that was used by both Ciro and Graflex. The focusing hood featured a Rollei-like latch instead of the Ciro’s inelegant lever, and a full-coverage magnifier panel popped up at the press of a button. Unfortunately, the DeJur was made only with the Alphax shutter – with a Rapax, this would have been a very nice camera. It had a short market life, being introduced just as Ciro was taken over by Graflex and disappearing again within about a year. 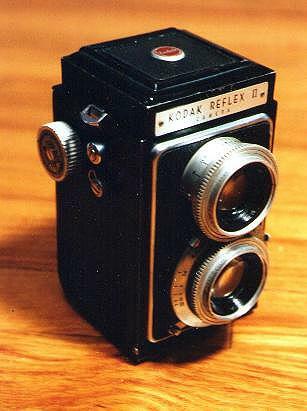 One of the better American TLRs was the Kodak Reflex (and the nearly identical Reflex II, pictured). Kodak designed an unusual 4-element lens for this camera, and the II was the first TLR to feature a Fresnel field lens to brighten the viewfinder. Unfortunately, like the late Argoflexes, the Kodak Reflexes accept only 620 film. Well, wouldn’t you know it; they were making TLRs in Japan too. This is the oldest Japanese TLR in my collection, and one of the most sophisticated made in that country. 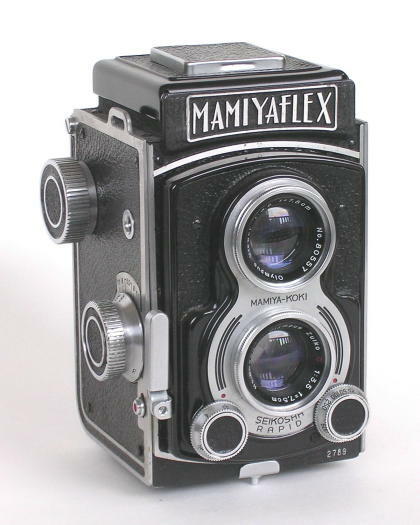 The Mamiyaflex A had a fully automatic frame counter, like the Rolleiflex…. and unlike the Rollei, in the Mamiya you didn’t even have to thread the film leader through rollers to make the system work. The camera also featured an optical sports finder, equalled only by the similar one in the Ansco, and this example shows off its Olympus Zuiko taking and viewing lenses. Mamiya never followed up with anything on this level; it may have just been too expensive to build. 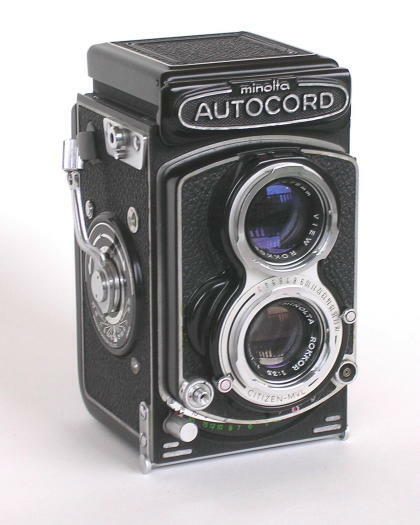 Generally recognized as the best of all Japanese TLRs, the Minolta Autocord evolved from the Minoltacord, which in turn was a direct copy of the Meopta Flexaret. The Autocord’s film wind system is robust and smooth, and its Rokkor lens is an exceptional performer for a Tessar type. The Meopta-inspired focusing system is convenient but also the camera’s Achilles’ heel, the most likely part to break. The most Rollei-like and probably the best known of the Japanese TLRs was the Yashica Mat, which evolved through 6 different models, all but the first having built-in light meters. It was probably not the best of the Japanese TLRs, but it was quite good; and the metering system in the Mat-124 line was surely the best in any TLR of its era. The final Mat-124G model was little changed from this Mat-124 except for a very nice coat of black paint. Toward the end of the 1950s, the term “Medium Format” expanded downward a bit to include 4×4 cm frames on 127 film. This format produced Ektachrome “Super Slides” that could be projected in a regular 35mm projector and gave an image of about twice the area on the screen. 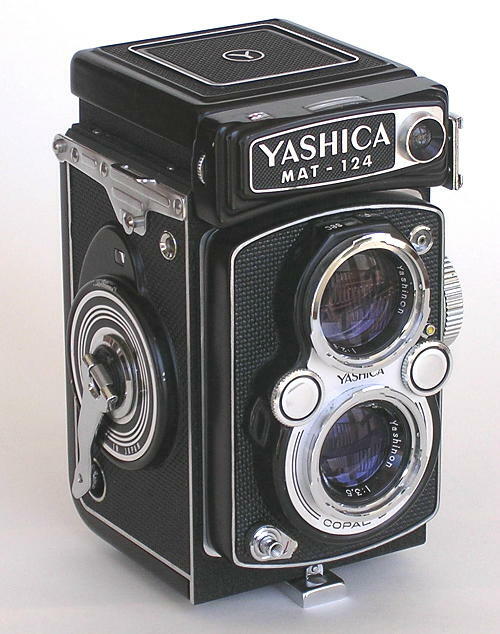 Yashica came out with a whole line of 4×4 cameras to parallel their 6×6 line, including budget-level, crank-advance, and metered models. 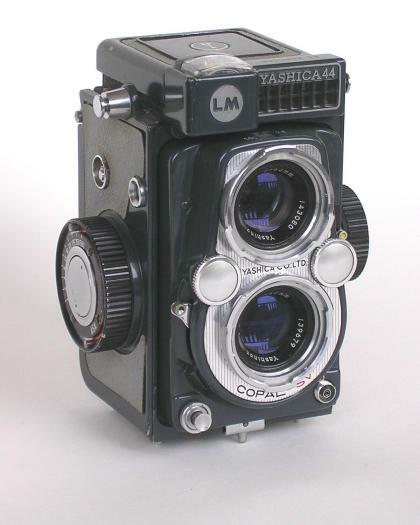 This 44LM was the top of the line, with a built-in meter and a Yashinon lens.